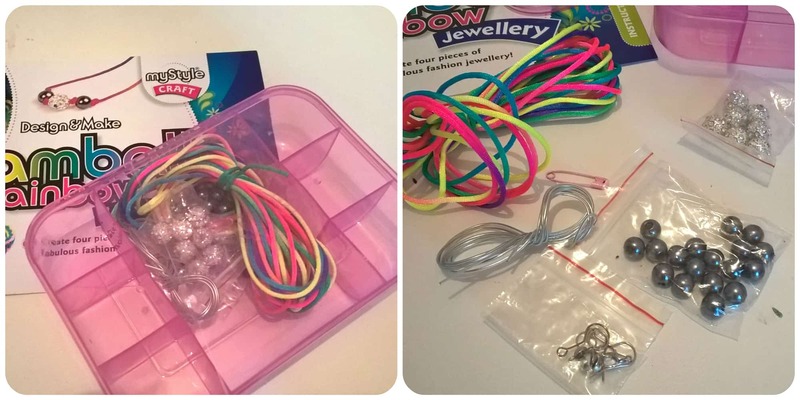 Shamballa jewellery has been a trend over recent years and this kit from Interplay to make some rainbow coloured Shamballa jewellery is a great introduction for young girls to learn and make some great pieces. The kit comes with a handy sectioned box to contain all your beads and accessories while you work, making life a little easier. Included are various beads, rainbow coloured cord as well as various clasps, wire etc. enough to make various pieces including bracelets, earrings and a necklace. We started making a bracelet which I started off for Miss M, although I was actually surprised at how easy it was to do, I thought it might be quite a complicated pattern to do, but no, just a placing one thread over another and looping it through. Miss M soon got to grips with this and happily completed the bracelet on her own adding beads appropriately along the design. 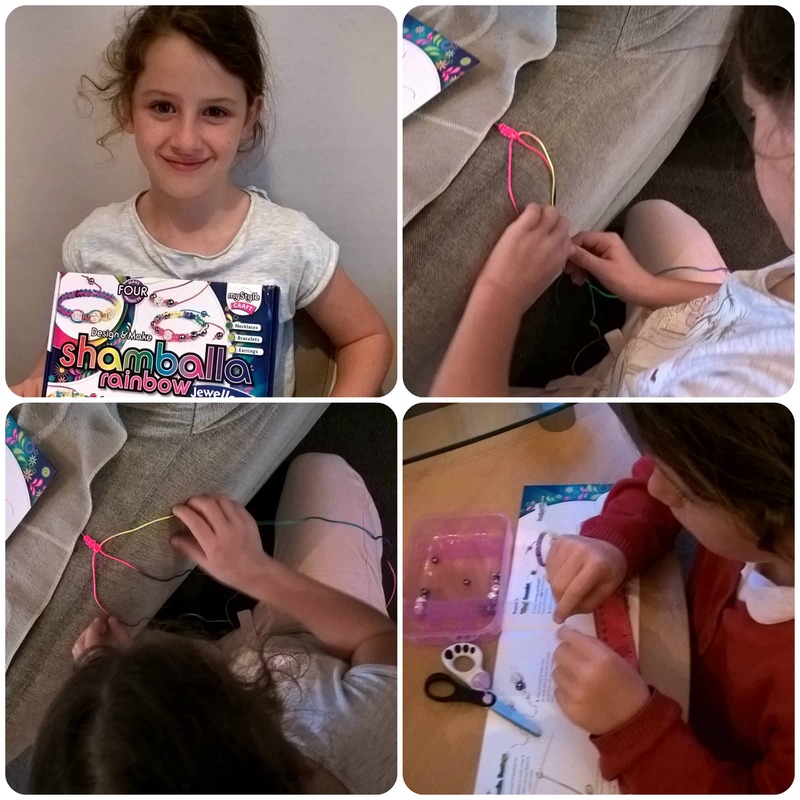 The set comes with a safety pin to use to attach the top of the bracelet to something whilst working on it, and we used the edge of our sofa bed which worked well and meant the bracelet hung down nicely allowing Miss M to easily see the pattern and keep the threads straight. You can vary the designs of the bracelets by adding beads at different places and there are also accessories to make earrings and a necklace. Miss M made me some earrings, as her ears aren’t pierced, which I was really impressed with. She used some wire which she twisted around and threaded some beads on too. Overall I have to say I’ve been impressed with this kit. 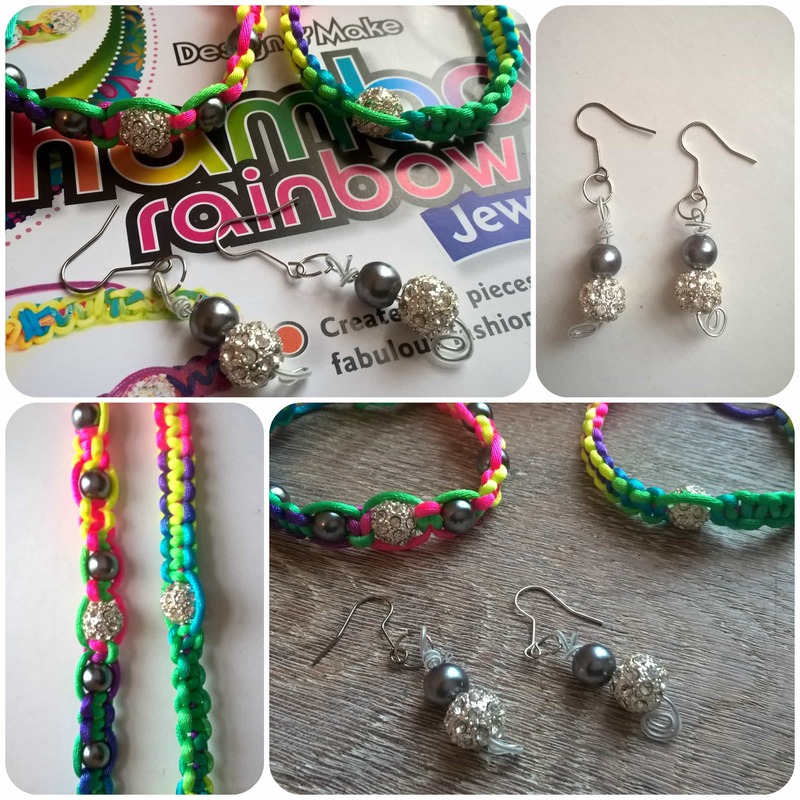 I didn’t realise how easy it was to make Shamballa style bracelets and this is a great introduction as to how it is done and the possibilities of styles you can make. Miss M had great fun making her new bracelets! 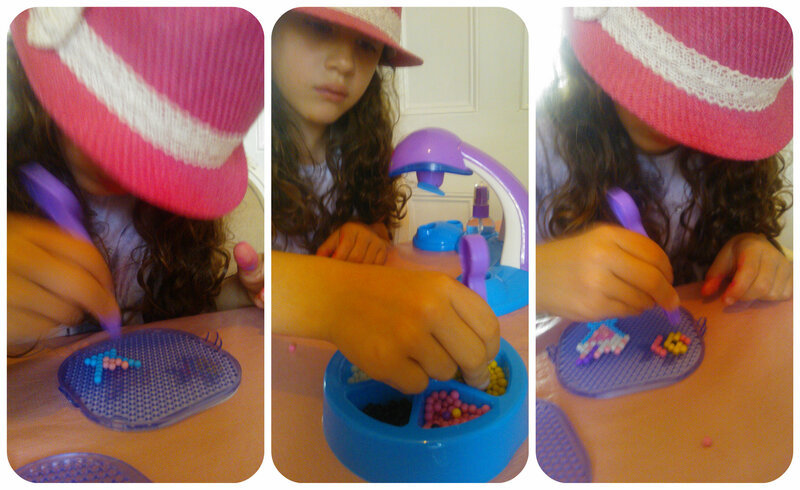 Beados Quick Dry Design Station from Flair is a fun way to make beaded pictures that stick together with water. This is a great starter set that includes a fan dryer for your pictures along with beads, templates and more. Miss M was very excited about trying this craft set, having seen the advert on television many times and being suitable for children 4+, she is a great age to try this. Being 6 years old, she was able to grasp the concept quickly and work independently which is good as it saves the frustration of not being able to do something on her own and she really feels like she’s achieved something at the end of it. There are three double sided design templates which you simply slot underneath a design tray. The trays are transparent so that you can see through to follow the design. Using tweezers with a special end to hold a little bead, Miss M set to work carefully placing the right coloured bead over the same colour in the pattern. She really enjoyed doing this and was eager to show me her finished picture. It was then time for the fun part which she really loved. Using the little spray bottle, you need to spray water across the design which melts the beads slightly and then put it under the dryer which helps to stick them together. Pressing the large button in the centre of the design station activates a fan which dries the Beados design. This does require 2 AA batteries to work. Once the Beados designs are dry, you can display them in various ways. A couple of little holders to stand them up are included along with some suckers to put them onto windows. We really enjoyed the Beados set, it’s quick to make a little design and they look bright and effective. 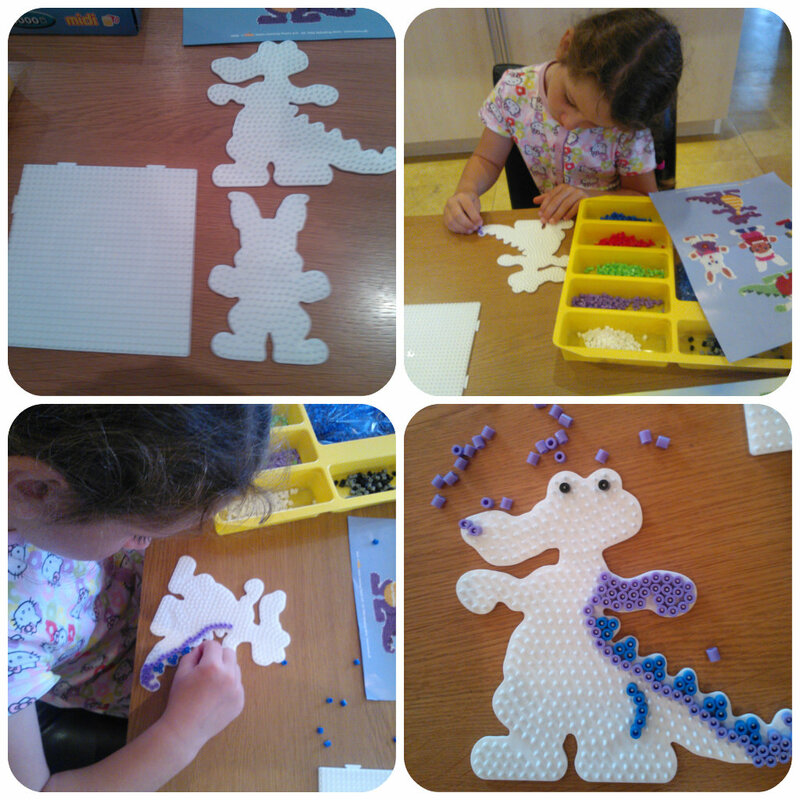 It’s fun for children to do and a great way for them to be creative as they can make their own designs. Refill packs of beads are available so the activity station can be used again and again making whatever their imagination lets them! All reviews are my own and my family’s opinions and we received the Beados set in order to write the review. 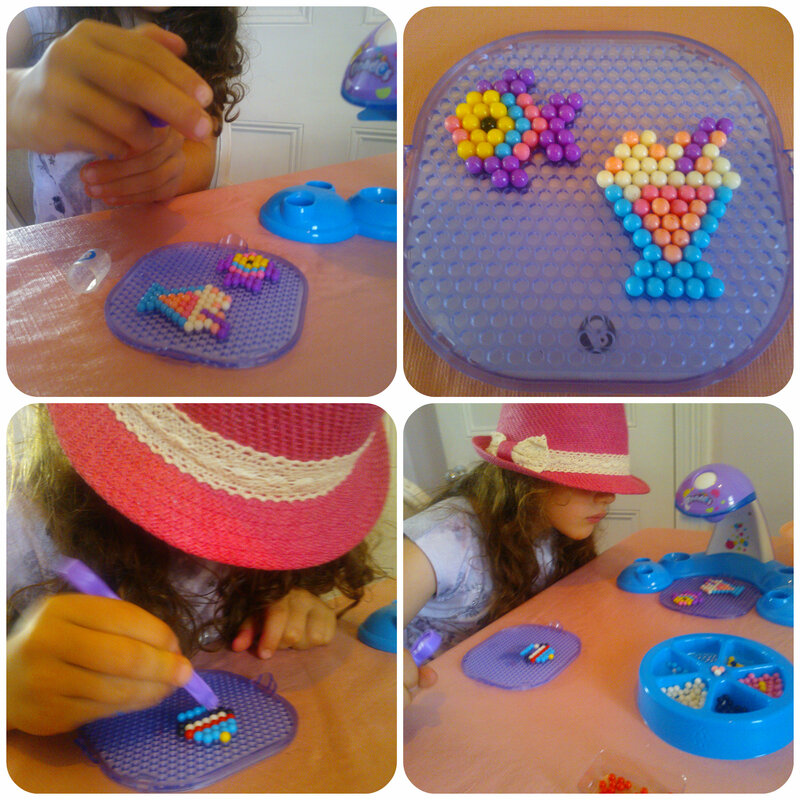 With a daughter who is a huge craft fan, it’s good to try a variety of activities and one we were keen to try is HAMA beads. DKL Marketing kindly sent us the giant set comprising of 6000 beads with endless opportunities of things to make, the limit is your imagination! 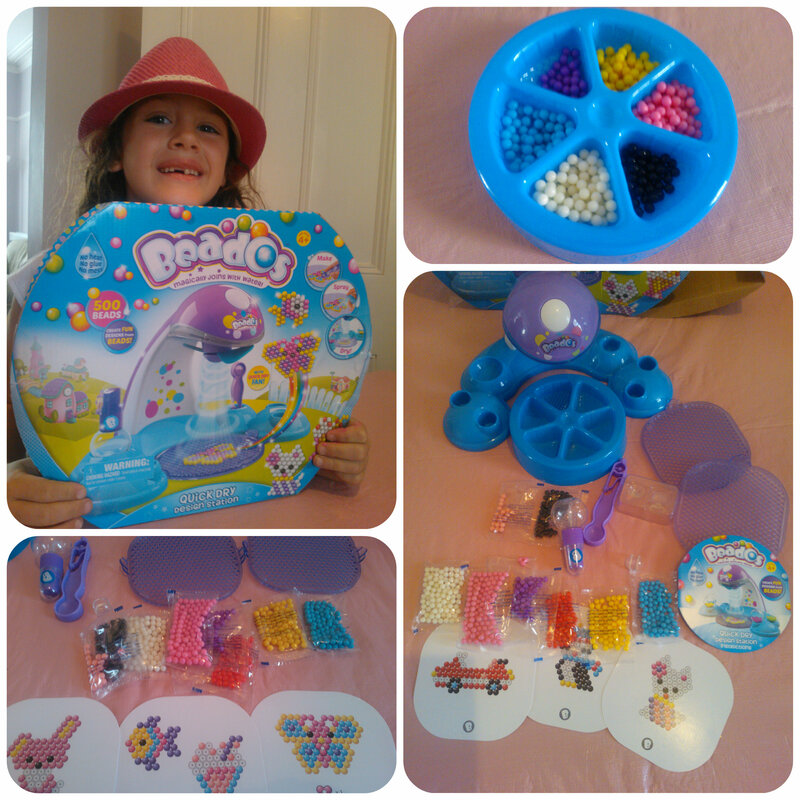 The HAMA beads box was big and immediately got a thumbs up from Miss M. It looked very excited, lots of beads, a good variety of things to make, and a craft toy that would give lots of value due to the amount of things to do. Miss M couldn’t wait to get stuck in and make a crocodile for her brother who had chosen that as his favourite picture from the front of the box. 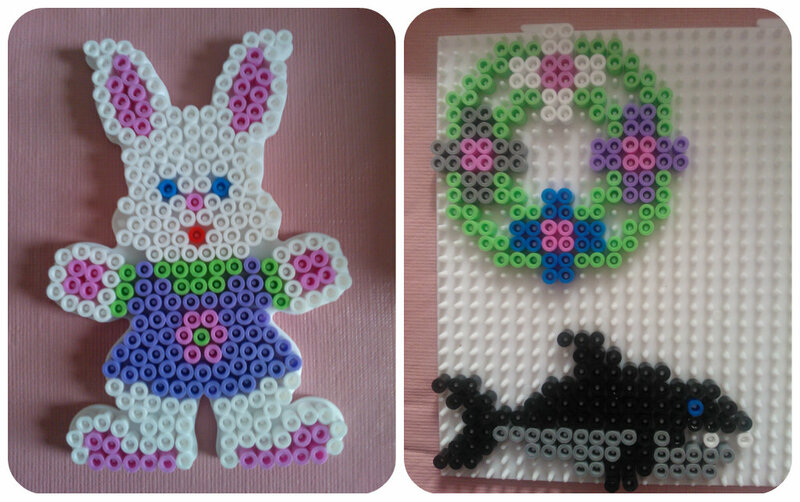 The HAMA beads are simple to place on the peg boards, just following the designs in the pictures. Included in this set are three peg boards, a crocodile shape, rabbit and a basic square which gives you the freedom to create anything you want. Having lots of simple designs is better for younger children so that they don’t get bored doing a large piece and also get to see the finished result sooner. Miss M is 5 yrs old and did require some guidance on starting off and I also needed to keep check on her during to make sure she wasn’t going off track with the design she was trying to make. It is a lovely activity that she can sit and do independently though and she enjoyed the challenge of trying to complete each one. Once all the beads are in place on a peg board, the magic really happens. After covering it in some special paper you can iron the creation which melts the beads. This bonds them together allowing you to remove the finished piece from the board. We’ve so far copied designs from the box and picture sheet included but we have many ideas to make other things. With such a vast number of beads in the box, there are endless possibilities and you can have ago at anything. Miss M would like us to try a cat and we are also going to do her initials. One thing that did slightly disappoint was that although we had a good range of colours in the box, we didn’t have a yellow, or a fleshy pink, and practically all the suggested designs contains one of these colours. Miss M in particular found this very frustrating initially but I explained that she could do them in any colour she wanted and just to swap a colour in the picture for one of her choice. This is a great activity that can be done throughout the year – great for those dull, rainy days when you are stuck indoors! It also has plenty of beads so will last a long time depending on the rate your child works through them, but can easily be packed away between designs and got out again at a later date. It is also something that can grow with your child as they go from copying designs to creating their own. 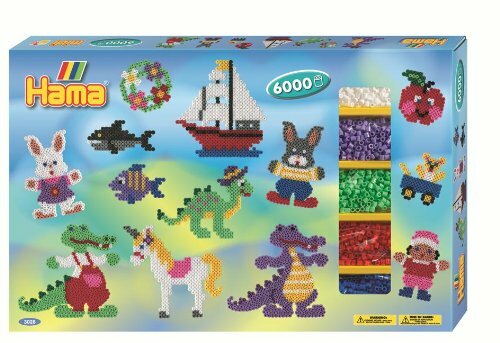 We’d recommend HAMA beads as a great crafting activity that helps with fine motor skills, creativity and encourages concentration.